Description Miller did not see this scene, which occurred during one of Captain Stewart's earlier trips to the mountains, but it was explained to him in detail and he painted several versions of it, including a large painting approximately 5 x 9 feet for Murthly Castle and this fine watercolor. According to LeRoy R. Hafen's account of the incident ("Broken Hand," p. 134), a band of young Crows invaded the camp while Fitzpatrick was away and Stewart was in charge. They carried off stock, pelts, and other property. They encountered Fitzpatrick on their return and stripped him of everything of value as well. As Stewart described the incident, the Crow medicine man had told the braves that, if they struck the first blow, they could not win. Thus, they had to provoke Stewart or someone in his party into striking the first blow. Stewart stood firm, refusing to strike. The Crows left, and the captain survived a situation in which he would have surely lost the battle. Fitzpatrick managed to talk the Crows into returning most of what they had taken. 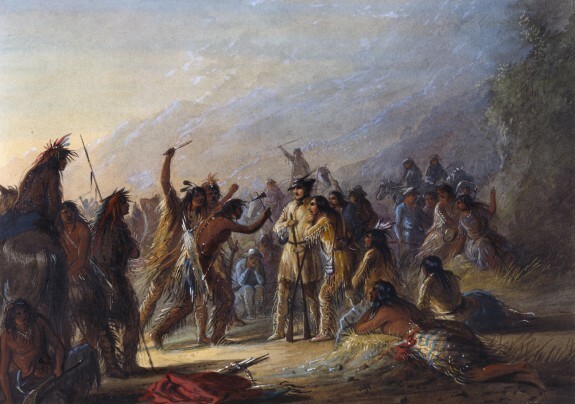 Alfred Jacob Miller: Maryland and the West. The Walters Art Gallery, Baltimore; Washington College, Chestertown; Frostburg State University, Frostburg; Jewish Community Center of Greater Washington, Rockville. 1988.